As detailed in artefact 2054 there was a lady in Quorn, Mrs Edith Marshall, (described a very posh! ), who was involved with Quorn Brownies and Guides. Her daughter-in-law was Daphne Oxenford, the well known presenter of ‘Listen with Mother’ during the 1950s and 1960s, and Daphne used to visit Quorn to open fetes etc. The first photograph shows David Marshall (Mrs Marshall's son and Daphne Oxenford's husband), with their two daughters, Kate and Sophie. The Brownie on the right is Judith Field. 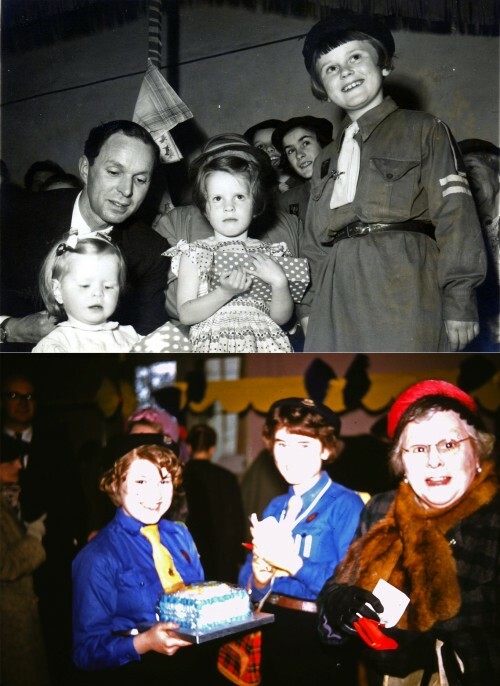 The second photograph is (left to right), Valerie Field, her cousin Susan and Mrs Marshall. Mrs Marshall, who lived on Chaveney Road with her son, seems to be having a go at 'guess the weight of the cake'!